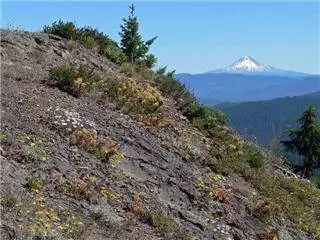 A thousand foot climb over two miles leads to an awesome open view of the heart of the Old Cascades and many of the new volcanic peaks along the new crest. The footing in the last mile to the summit via Willamette NF Trail 3369 is not real good. Heading east to Silverking Mountain, the travel is fairly easy, most of the climbing to the ridge in the first mile. There is no water along the ridge. A nice campsite is located about a half mile east of the Battle Ax Creek trail junction (3369). Footing towards the east end of the trail becomes poor traversing a south face of an un-named peak just before the junction with the Bagby Trail 544. Many people use this trail to access Twin Lakes, a popular overnight destination. It is also a relatively easy way to get to Silverking Lake. This trail runs the divide between the Santiam and Clackamas drainages along the ancient “Mollala trail”. The 3369 trail dropping off this ridge to the south is the responsibility of the Willamette National Forest. It is also referred to as Whetstone Mountain Trail. A long abandoned and extremely difficult to find segment of this trail runs west along the divide to Burnt Mountain where it then ran north to Baty Butte beyond via Baty Butte Trail 545. Over Nohorn Butte, a route ran towards Table Rock.